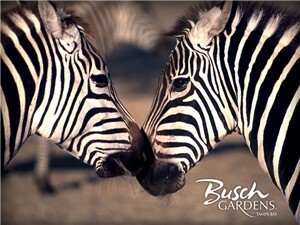 Busch Gardens is divided into various areas, all linked to a common theme of Africa. Featuring more than 2,700 animals. The Park also has numerous roller coasters, attractions, water rides, restaurants and shops. One hour from Orlando via Interstate 4. Adult admission - $53.95 plus tax. (Children under 2 are admitted free). Admission includes access to all rides, shows, and the majority of attractions. Prices range from $5 to $10 - depending on the vehicle. Generally from 9:00 a.m.- 6:00 p.m. The park is open year-round with varying operating hours. Hours are extended during summer and holiday seasons. Guests may choose from eleven restaurants, ranging from full service to cafeteria style fare. SheiKra - Opening Spring 2005, this attraction will carry riders up 200 feet at 45 degrees, then hurtle them 70 mph back toward the ground at a 90-degree angle. It will be the first coaster of its kind in the Americas and only the third in the world. SheiKra also includes a 360-degree climbing carousel. 3,188 feet of steel track offers a total ride time of just over three minutes. Congo River Rapids - Raft through a geyser, waterfall and other obstacles. You must be 42 inches tall to ride this ride and other safety restrictions may apply. Gwazi - The Southeast's largest and fastest double wooden coaster. Two coasters intertwined: Gwazi Tiger & Gwazi Lion. You must be over 48 inches tall to ride. Kumba - Experience a 135 foot drop as you plunge from 110 feet into a diving loop. You must be 54 inches tall to ride Kumba and other safety restrictions may apply. Cheetah Chase - Challenge the crazy curves and hairpin turns of this five-story family coaster. Cheetah Chase takes you on an adventure in the heart of exotic Timbuktu. Akbar's Adventure Tours - Seasonal simulator adventure. King Tut's Tomb - Visit a realistic replica of King Tut's burial site. Kids are allowed to dig on their own. The Land of the Dragons' - Features a tree house, an enchanted forest, waterfall, rides and dragons. Height restriction on the children's rides are a maximum of 56" tall. Skyride - View Busch Garden's scenery from above. Serengeti Express Railway - Tour the Serengeti Plains and continue around the park making stops in both Stanleyville and Nairobi. Montu - Encounter speeds of over 60 miles per hour. This coaster has an inverse and vertical loop. You must be 54 inches tall to ride and other safety restrictions may apply. Python - A double spiraling corkscrew roller coaster with a 70 foot plunge. You must be 48 inches tall to ride and other safety restrictions may apply. Scorpion - Roller coaster with a 60 foot drop and 360 degree loop. You must be 42 inches tall to ride and other safety restrictions may apply. Stanley Falls - Log Flume ride, ending in a 40 foot drop. Tanganyika Tidal Wave - Step aboard a 20 passenger boat that ends with a plunge down a 55 foot drop. You must be 48 inches tall and other restrictions may apply. Bird Gardens - Check out almost 500 tropical birds from around the globe. Enjoy a live show, visit an aviary, and view bald and golden eagles in Eagle Canyon. Birds of Prey - Take a journey into the world of rare raptors. Edge of Africa - Guests are taken on a safari with hippopotamuses, hyenas, vultures, baboons and many more animals. Lory Landing - View a variety of remarkably colored birds, including parrots, lorikeets, hornbills and pheasants. Rhino Rally - Experience an off-road adventure through the wilds of Africa. Serengeti Plain - Climb aboard a safari truck which tours the Serengeti Plain. Encounter a variety of animals including giraffes, zebras and gazelle. Myombe Reserve - Tour the "Great Ape Domain" amongst waterfalls, mist and fog, to get an up close look at incredible primates.